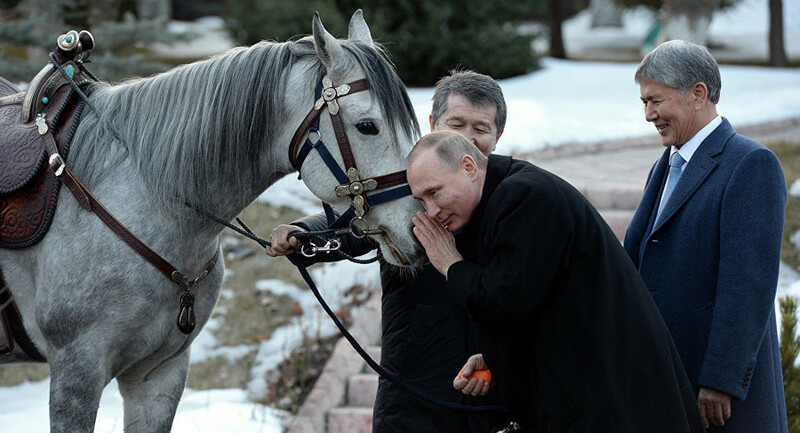 The Kyrgyz government has given Vladimir Putin a pedigree race horse, which he quickly befriended with a carrot. It’s no surprise – Putin has a way with animals. We decided to look back at the best of the president’s animal moments. Putin’s beloved Labrador Connie was in the president’s family since his first term as Russian president, but has now passed away. However, apart from being “the first dog,” she enjoyed quite a successful career as a book character, inspiring the children’s book Connie’s Stories, and a series of comics called Connie and her Master (yep, Putin is in the comics, too). But her 15 minutes of fame came to her when she unintentionally (we guess) intimidated German Chancellor Angela Merkel, when the latter was on a visit in Sochi in 2007. The dog sat by Merkel’s side the entire evening, making the chancellor look very uncomfortable. Later, Putin said he did not mean to scare the chancellor, and when he found out that she doesn’t like dogs, he apologized. 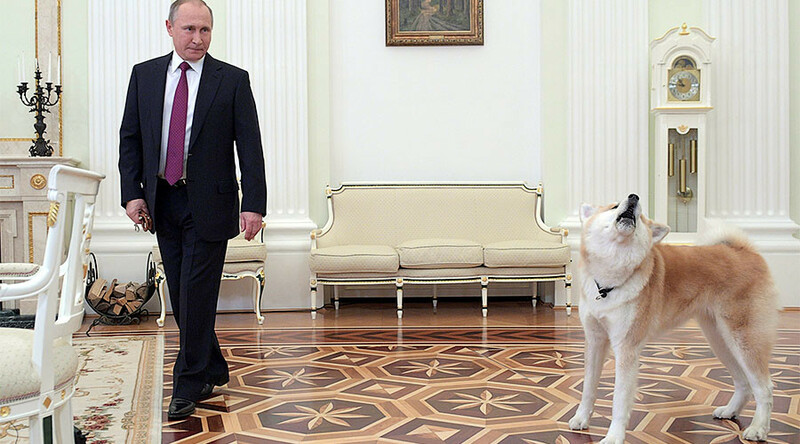 Putin was recently forced to use his dog-handling skills when his boisterous Akita breed dog, Yume, refused to follow protocol in front of visiting Japanese journalists. Given to the Russian president by the governor of Japan’s Akita prefecture four years ago, in December last year she appeared before Putin’s interview to Nippon TV and Yomiuri Shimbun newspaper. The dog began barking loudly and inching towards the interviewers, who stood frozen with – somewhat mortified – smiles. The Russian president calmed the pet with dog treats from his suit pocket. He also joked that “Yume is a no-nonsense dog,” and a very good guard dog. Dogs are not the only animals that take a liking to the Russian president. In 2014, Putin visited the Persian Leopard Breeding and Rehabilitation Centre at the Sochi National Park. He went into a cage with a leopard, which sniffed him for some time but later did not seem to object to sitting next to Putin. The center’s workers said the cat felt like an equal to the Russian leader. At the G20 summit in Australia, Putin was cuddled by a koala. Yes, that’s right – a special cuddle-trained koala, too, as media reported at the time that several animals had taken hug classes to make a furry surprise to world leaders. The cute marsupial even sank its claws into Putin’s suit, but this was taken as a friendly gesture. On his way to meet the leaders of APEC countries in Vladivostok in 2012, Putin took part in a project to save the Siberian cranes. To do it, he had to make three sorties on a hang-glider from a local ornithological station to lead the cranes raised in a nursery into the sky for their first flight. Adorned in white overalls to resemble a bird, Vladimir Putin did manage to get some cranes to fly. When he visited the construction site of the Vladivostok Oceanarium in 2013, Putin was greeted cordially by the staff – and the performers. Three dolphins applauded the president for feeding them fish, while the walruses even shook his hand. In 2010, Putin visited the island of Alexandra Land in the Franz Josef Land archipelago in the Arctic Ocean with a group of scientists from the Institute of Ecology and Evolution, who study polar bears using satellite transmitters. 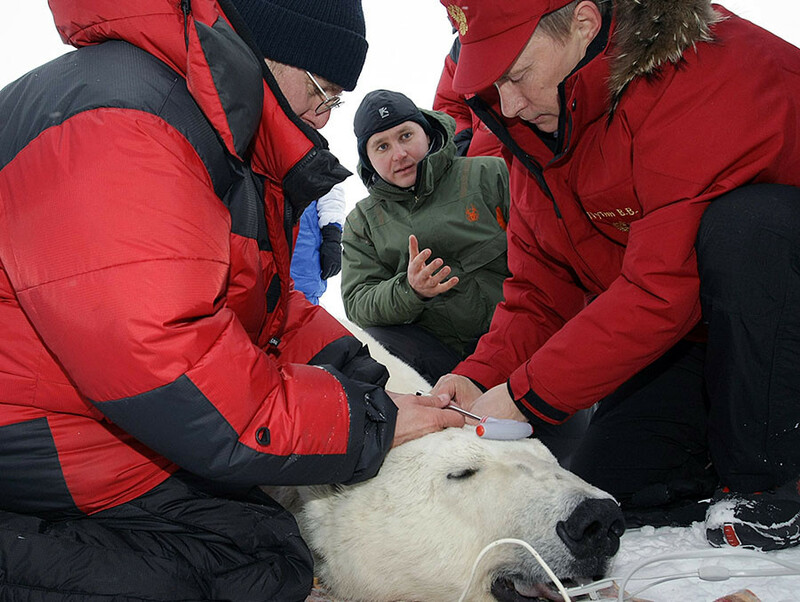 One transmitter was put on a sleeping bear by the president himself, who also assisted the team in weighing the animal, which was 231 kilograms, by the way. During his vacation in remote areas of the Tuva region in 2013, Putin and Prime Minister Dmitry Medvedev went fishing. And the fish did come – a 20-kilogram pike fish went straight into the net. What happened next? Putin kissed the fish and set it free. There were also horses, ponies, goats, tigers, a crocodile, and a whale. 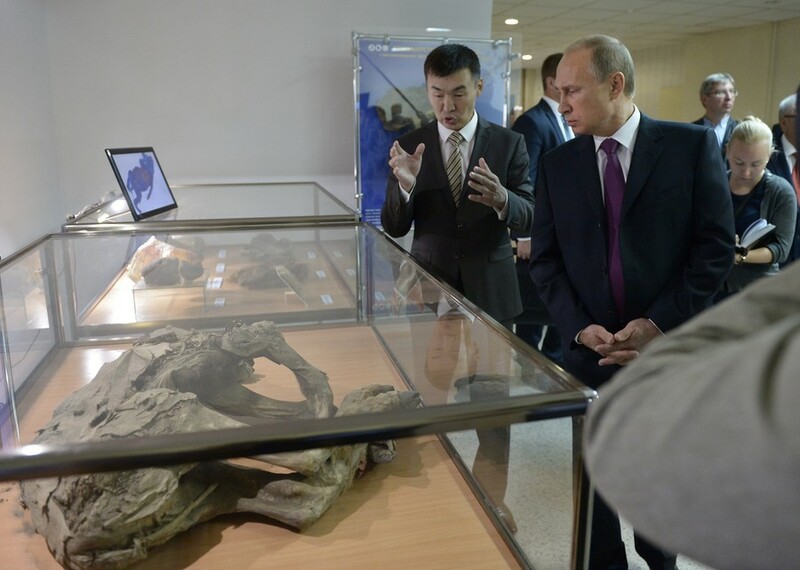 In a museum in Siberia, the president even “met” a 28,000-year-old baby-mammoth mummy.